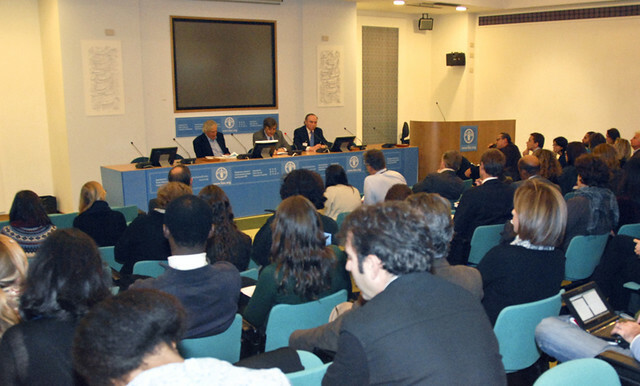 The event was chaired by Kostas Stamoulis (Director of FAO’s Agricultural Development Economics Division) and attended by about 80 participants from both FAO and outside. Andrew MacMillan, former FAO Director and active member of the FSN Forum online community, and Ignacio Trueba, emeritus professor at the University of Madrid, have been driven to write their book by their frustration over the lack of progress towards hunger eradication, and what they see as a lukewarm commitment to changing the ways in which food is produced and consumed towards more sustainable systems. In other words, they made it clear that “business as usual” is not achieving the necessary results. In their book, Andrew and Ignacio define the food management crisis as something that goes beyond highly visible humanitarian disasters and the dramatic effects of price surges on the nutrition of the poor: they point to the risks of irreversible damage to natural ecosystems used to produce food, caused by trends towards over consumption and waste of food, especially in industrialised countries. They also worry that the institutions responsible for the global governance of food do not have the powers necessary to ensure that any future food crises do not throw more people into hunger while the better-off continue to eat more than they need for a healthy life. Distinct strategies are needed to eradicate hunger on the one hand, and to ensure global food security through sustainable food production and consumption systems on the other. The level of public attention given to hunger reduction and sustainable food management has to rise: NGO-led education-based campaigning can increase public pressure for action by governments. Governments committed to ending hunger should create national scale targeted social protection programmes that provide regular and predictable grants to all under-nourished families, to enable them to close their food gap (if accurately targeted, this would require less than 2% of global food production or 15% of food wastage in industrialized countries for 1 billion people). To maximize the local benefits of social protection, governments should ensure that small-scale farmers have access to the means and knowledge to be able to respond to the extra food demand that has been created. As social protection measures succeed in enabling people to climb above the hunger threshold, other locally relevant activities can be initiated, including nutrition education, food supplementation for mothers and infants, skills training for subsistence farmers and urban adults, school meals, improvements to local infrastructure, access to primary health care and education, especially for girls. Future growth in demand for food must be slowed through providing incentives for over-consuming countries to put in place policies and programmes to cut excessive food demand and wastage. The creation of a voluntary Global Mechanism to Cut Food Waste and Over-Consumption, based on similar principles to those of the Clean Development Mechanism, should be considered. Amongst other measures for curbing excessive consumption, punitive taxation of foods with high environmental footprints relative to their nutritional value is proposed and using of the revenue to finance sustainable production. Environmentally and socially sustainable small-scale farming should be promoted in countries with a high incidence of hunger. Global institutions responsible for food management should have the powers, authority and means to oversee rapid progress towards hunger eradication. New forms of financial cooperation, based on the principle of compensating for inequitable use of global resources, must be created to enable countries to take up the above recommendations. More South-South cooperation needs to be mobilized for programmes design and implementation. In the discussion that followed, participants reflected on how global and local food systems should be revisited, on the role of the rights-based approach and of education, and on how to promote sustainable and low input agriculture in a world pressured by big and influential players.